Chilling effect can be produced by vapour compression or vapour absorption cycle. In vapour compression engineering, the compressor is used for chilling effect. Whereas this compressor is replaced with a solution circuit and a pump, and this function is commonly referred to as a thermal compressor, thermochemical compressor or a chemical compressor in absorption cycle. How are Vapor Absorption Chilling Process is classified? There are two major classes of absorption equipment, direct-fired and indirect-fired. Direct-fired equipment has an integral burner as the heat source, while indirect-fired equipment uses hot water or steam as the heat source for chilling. These are further classified as a single effect, double effect and multiple (Triple) effects. Absorption chillers’ thermodynamic cycle is driven by the heat source; this heat is usually delivered to the chiller via steam, hot water, or combustion. Compared to electrically powered chillers, they have very low electrical power requirements – very rarely above 15 kW combined consumption for both the solution pump and the refrigerant pump. However, their heat input requirements are large, and their COPs are often 0.5 (single-effect) to 1.0 (double-effect). For the same tonnage chilling capacity, they require much larger cooling towers than vapour-compression chillers. However, absorption chillers, from an energy-efficiency point-of-view, excel where cheap, high-grade heat or waste heat is readily available. What is the Difference between Vapor Compression and Vapor Absorption Cycle of Chilling? 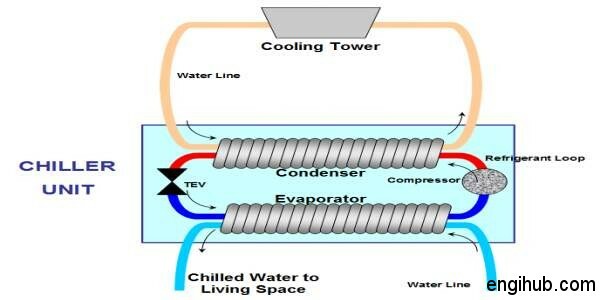 The basic difference between the vapour compression chillers and absorption chillers is that vapour compression chiller uses an electric motor for operating a compressor used for raising the pressure of refrigerant vapours whereas an absorption chiller uses heat for compressing refrigerant vapours to a high-pressure. The rejected heat from turbines, microturbines, and engines may be used for chilling. In a vapour compression cycle, the low- pressure vapour is mechanically compressed. In an absorption cycle, the low-pressure vapour is absorbed into a low-pressure solution, pumped to a high pressure and then heated to produce a high-pressure vapour. How to select the pump for vapour absorption chilling? Process pump specifications that are important to consider include the process flow, process pressure, pump material, rubber parts and mechanical shaft seal material, motor voltage, motor electrical class, motor IP rating and pump rating. Other important specifications include the internal water tank size and materials and full load amperage. Which Solution Concentration levels should be used? The solution has a low capacity for absorbing refrigerant. The solution contains a high level of refrigerant in relation to the maximum that can be absorbed at a given temperature and proportionally lower levels of the absorbent. The solution has a high capacity for absorbing refrigerant at a given reference temperature. The solution contains a low level of refrigerant and proportionally high levels of the absorbent. What are the Advantages of Vapor Absorption Technology? Uses water as a refrigerant instead of ozone-depleting Chlorofluorocarbons. Absorption chillers may have a lower operating cost than motor-driven vapour compression chillers. Absorption chillers have lower noise and vibration generation than motor-driven vapour compression chillers. Power required for only small pumps.